You'll be so proud of yourself after building this 10x16 barn shed. Plans are available in pdf format for immediate download after making a secure purchase through paypal. 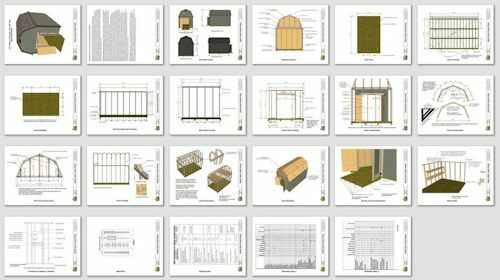 Along the way through the building process and even before building begins, I offer email support for any questions you might have! 10' wide x 16' long x 13' 10"tall. 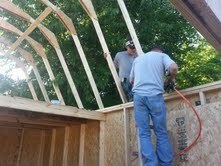 Large 4' loft storage area in ceiling. Smartside engineered and pre-primed long lasting siding panels. Anchored wooden shed floor accepted by most building codes. 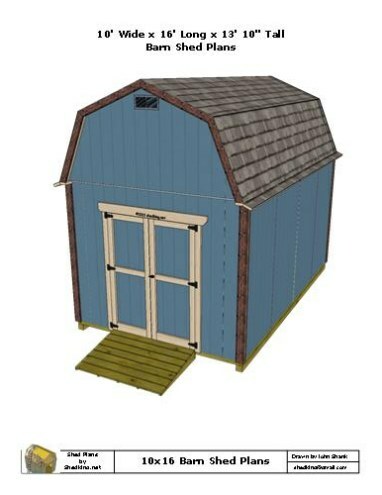 Here's some pictures of a motorcycle shed Mike built using these plans. These plans will be emailed via a supplied download link immediately upon secure payment through paypal and e-junkie.com using the Buy Now button located below. You do not need a paypal account to use paypal for payment. Before paying for these plans please make sure your email will accept email from e-junkie.com and shedking.net. If you have trouble getting the plans, or just need further information about the plans please contact me.